Observation - Yellow Horned - Achlya flavicornis - UK and Ireland. 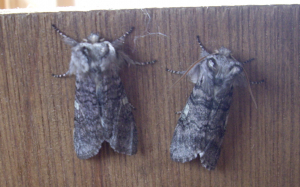 Description: There were a number of these in the moth trap last night. I think the one on the right is a Yellow Horn, but am unsure of the one on the left, its bigger and does not have yellow antennae. There were a number of these in the moth trap last night. I think the one on the right is a Yellow Horn, but am unsure of the one on the left, its bigger and does not have yellow antennae.